For purpose of example, suppose that you are an outbound dialing administrator in Indianapolis, Indiana. Your goal is to dial contacts in Honolulu, Hawaii from 8:00 a.m. to 5:00 pm Honolulu time, Monday through Friday, to conduct a customer satisfaction survey. 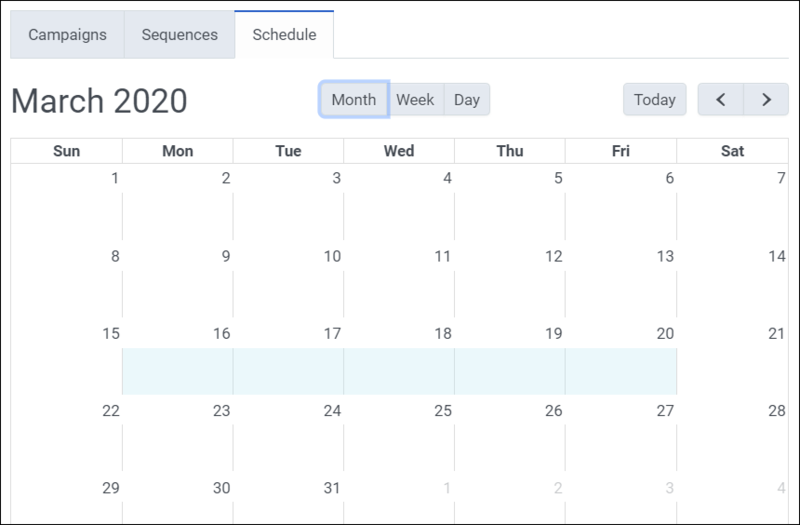 Since our example calls for scheduling a contiguous range of days, it is easiest method is to select a Month view. This view allows an administrator to configure a range of days at once. Click the Month button. Select Campaign or Sequence from the Resource Type drop box. For the example scenario, select Campaign from the Resource Type drop box. Optionally select a time zone from the Time Zone list. This step identifies the time zone used by the resource, eliminating the need to calculate offsets between the time zone of the administrator and the zone of the resource. 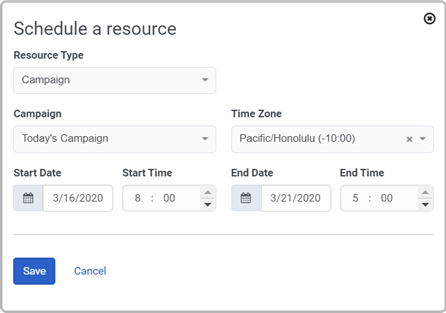 A campaign administrator in Indiana would select Pacific/Honolulu as the time zone, and then set the start time to 9 AM and the end time as 6 PM. The administrator can be confident that the resource runs between 9 a.m. and 6 p.m. Hawaiian time, without having to calculate offsets between his zone and Hawaii’s time zone. Tip: Selecting a zone makes it easy to describe when a resource runs, since the system sets times from the perspective of someone in that time zone.